Deepika Padukone in monochromatic jumpsuit. Designer Sheela Nathani did marvelous job with this vertical striped jumpsuit , and when its wore by Deepika well you cannot hope to get any better model than Deepika to fit in there. The leggy lass kills it in the hot striped jumpsuit. The makeup on Deepika though little plasticky but manages to give that polished high society look that the chicks always crave for. (its great for selfies thats why ). Deepika has started of as a model and she is really kicking it in Bollywood as well as fashion and modelling. 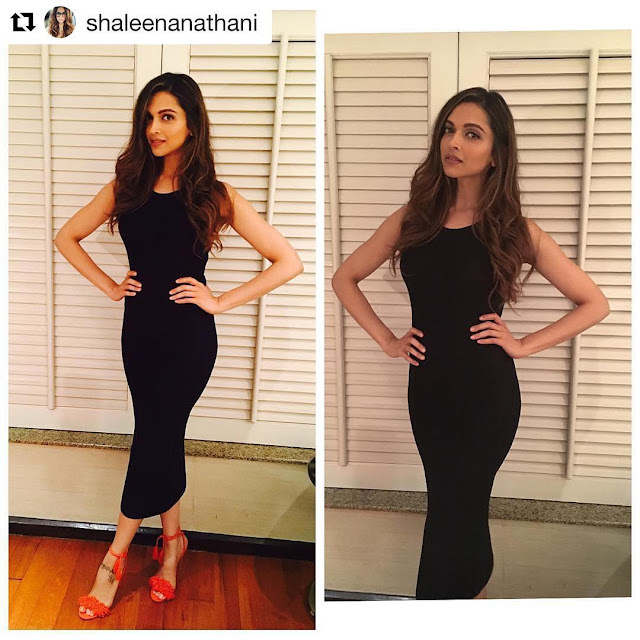 Deepika looks simply sensational in this figure hugging black dress. Her hour glass figure is enhanced and nicely contoured by black dress. Some Bonus , Deepika wearing a white netted short dress. Hot stuff.